Fonterras is a New Zealand based multinational dairy company. 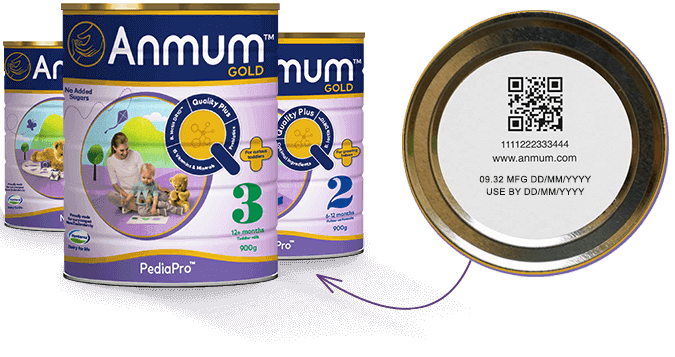 In April 2017, the company added QR Codes to the packaging of their pediatric range, Anmum. The QR Codes are part of the company’s initiative to help their customers learn more about what goes into their products. Here we’ll call it a product QR Code. The QR Code links to a web page listing the ingredients used in the product. The web page also gives information on the product’s authenticity and batch number. The content on the web page changes regularly. Users can scan the same QR Code anytime to view latest updates on the product. “By scanning the QR code to trace the product’s journey, consumers can be reassured about the quality and safety of our products – and this is fundamental to being the most trusted source of dairy nutrition.” – Teresa Smyth, Group Marketing Manager, Anmum. Fonterras plans on making all their products electronically traceable by 2020. The company aims at making 90% of their plants connected to electronically traceable data by the end of 2017. Consumers now are more aware than ever in terms of the products they use and consume. To answer potential questions and concerns, many food and beverage companies countries across the globe are adding QR Codes to their packaging. What are your views on the practice of adding QR Codes to packaging? Share your thoughts in the comments section below.